An artificial construct from Greek Mythology. 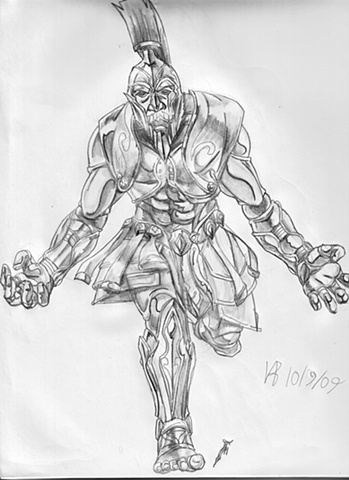 Talos, was a 20 foot tall Bronze Giant, created by Dadealus and was guardian of an island where it hurled boulders at Jason and the Argonauts, until Medea exploited the one weak spot of the armored centurion, a spike plugged into the heel of its foot where its fuel source, ichor, flowed through. Upon pulling it out, the giant shut down. I designed it more so with Achilles armor from the movie, Troy, to show the similarities between the two, mainly in both their weak points, and in posing him in a fit of fury. My regret is in wishing I could showcase him more, since I actually enjoyed the pre-production phase of designing him.